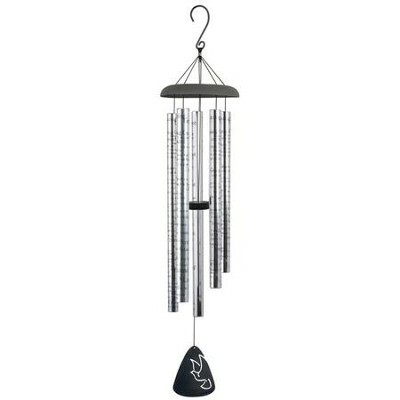 The beloved hymn "Amazing Grace" is engraved on the tubes of our 44" Sonnet windchime, with a melodious sound for home or garden decor. Each 1.25" tube is crafted of heavy gauge aluminum, with a unique adjustable striker which allows you to adjust the tone to your liking. Dove motif; five tube chimes; silver and black finish. Q: Are the tones only the notes to "Amazing Grace" of your "Amazing Grace" wind chime with words to song on the tubes? Although this wind chime has 5 melodious notes in adjustable tones, we could not verify that the notes make the melody to "Amazing Grace". I'm the author/artist and I want to review Amazing Grace Tube Chimes.